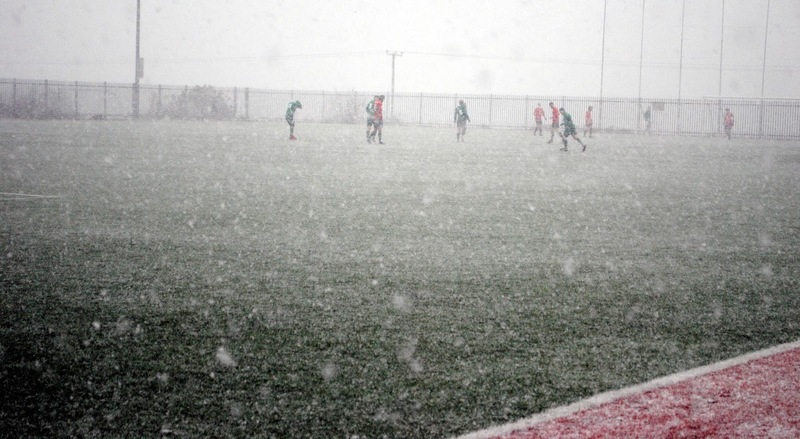 With the exception of Pearse Celtic's game in Limerick, Just 2 x games survived, but only as far as the half-time stage before being cancelled due to terrible weather conditions. Munster Junior Cup 5th Round: Janesboro (Limerick) v Pearse Celtic A (2pm). Premier League: Carrigtwohill Utd v Grattan Utd (off); Coachford v Knocknaheeny Celtic (off). AUL 1: Waterloo v Rathcoole Rovers (off); Temple Utd v Donoughmore Ath (off). AUL 1A: Glenthorn Celtic 1 UCC 0 (abandoned at half time due to weather). AUL 2: Knocknaheeny Celtic 3 Castleview 1 (abandoned at half time due to weather). AUL 3: Lakewood Ath v Ard Na Laoi (off); Ballinhassig v Greenwood (off); Bweeng Celtic v Killumney Utd (off). AUL 3A: Parkview Celtic v Watergrasshill Utd (off). 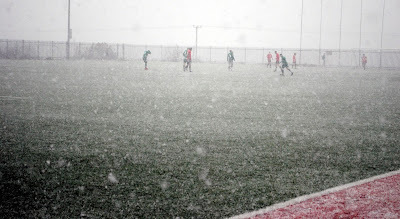 These were the conditions at the Mayfield United all-weather complex before the match had to be eventually abandoned for safety reasons. Glenthorn Celtic B were leading 1-0 over UCC A at the time of abandonement.